From 1861 to 1864 Christmas was difficult for families on both sides of the conflict between the North and South. My great-grandmother Sallie Dyer told of her worst Christmas ever in 1864 when she had not heard from her true love, Manfred, since early November before the battle of Nashville. 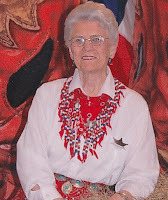 She had no idea where he was or if he had survived the battle his regiment fought in Tennessee. fate of their loved ones or mourned the passing of sons, brothers and husbands. Despite the circumstances, the holiday and celebrating the birth of Jesus was important to both sides. Stories are told of units spending Christmas Eve with enemies singing Christmas carols across enemy lines in a night when the guns were silent to remember the Savior’s birth. During this time, the first introductions to the modern image of jolly old St. Nick entered their lives through drawings by an immigrant German-speaking artist, Thomas Nast. 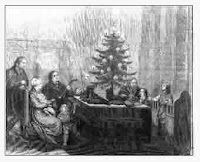 Another German custom, the Christmas tree, also played a role in the celebration of Christmas with table top size trees and beautiful ornaments, some of them home-made. Christmas packages were sent to the front and in most cases were delivered. One soldier, John Haley of Maine, wrote, “It is rumored that there are sundry boxes and mysterious parcels over at Stoneman’s Station directed to us. 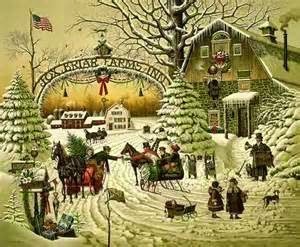 We retire to sleep with feelings akin to those of children expecting Santa Claus.” Many letters home mentioned decorating camp Christmas trees and having a dinner of salt-pork and hard tack. The holiday reminded everyone of the melancholy settling over the entire nation. 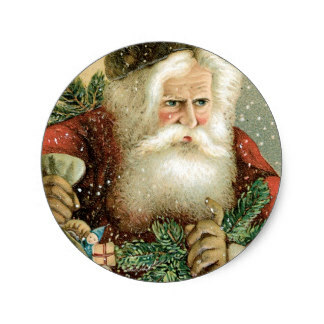 Many parents, especially in the South, warned their children that Santa might not make it across enemy lines thus no gifts under the tree for Christmas morning. Soldiers were reminded more acutely than ever of the domestic bliss left behind. The people of Fredericksburg, Virginia had the war brought right to their doorstep only a matter of days before the holiday. Theirs was indeed a bleak Christmas. Perhaps the most well-known war-time Christmas event is the capture of Savannah by General Sherman who wrote a letter to Lincoln on December 22, 1864 giving the President the gift of the beginning to the end of the war. 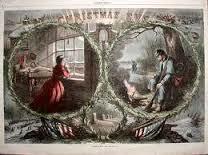 Christmas served as both an escape as well as a reminder of the conflict dividing the country. Families back home celebrated but with an eye on that empty chair at the table, wondering when it would again be filled. Children were content to receive hand-carved toys, fruit, and other home-made items. Even General Sherman’s men brought food to starving families in the war stricken Georgia countryside. 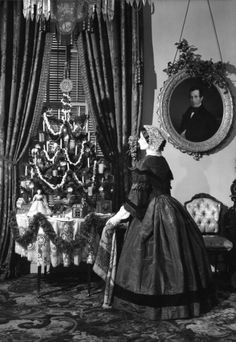 The novel, Little Women, was one of my favorite books and I remember Christmas for the March girls during the war. Christmas went on despite horrific conditions and loved ones missing from the family gatherings. Other wars since that time have brought the same feelings of loneliness and loss to countless loved ones. Through it all, Christmas was one holiday that brought hearts together to celebrate the birth of our Savior, Jesus Christ. I remember my mother's cousin telling of a similar incident in WW 2 when the guns were silent on Christmas eve and they sang carols in English and German across the battle front. Christmas has not boundaries. Amazing.